Hello. I'm Kate Murray, Owner of Mathnasium of The Beach, your neighbourhood math-only learning centre. We help kids in grades 2-12 understand math by teaching the way that makes sense to them. Since we opened in 2014, Mathnasium of The Beach has been helping students in the community increase their confidence in math. Mathnasium of The Beach is a proud partner of Breakfast Club Canada, making a difference one breakfast at a time. We are located on Queen Street East, just west of Woodbine Avenue. Come and visit us at the Centre for a FREE Trial and see how we can help your child become CRAZY about math! For existing mathletes, please click below to book your next training session! The whole staff is great! They are very helpful for our son. Keeps me updated on progress and areas of focus. My son loves coming here and Math isn’t such a huge issue. The staff are the strength of this organization. My daughters love going to mathnesium. And we see the results. My 10 year old son thoroughly enjoyed his time with Mathnasium at the Beach location over the past 7 months. Overall, he become more confident in math, plus improved his math marks at school. He seemed to really bond well with Jordan who quickly became his favourite tutor at Mathnasium! My son doesn't mind going - that says tons! Really good, attentive staff. My daughter enjoys and looks forward to going and I think that has everything to do with the staff. She enjoys working with Hassem, Mark and Jordan and I feel as though they like working with her too. I don't know if the correlation between her enjoyment of math and the fact that she goes to Mathnasium is justifiable but she does well in math at school and we don't have to argue with her to go to Mathnasium. We have been going for over 3 years and will continue for as long as she enjoys it. My child was always interested and engaged. This is the second time my son is coming to Mathnasium. He really likes working with Mark and is so far having a great experience. Nicolas is always happy to come to Mathanasium and he is no longer saying “I hate math”. Mathnasium in the Beach was perfect for my son, Christian, this summer. He liked Mark and the other instructors there. They were flexible enough to come up with a programme for him as our needs were a little different — we wanted them to teach him the material for the upcoming school year. He is much more confident in math than a year ago. Thank you Mathnasium in the Beach! Mark and the entire teaching staff at the Beaches Mathnasium location have been wonderful for my 8 year old daughter. She already liked math, but wasn't terribly motivated to think about it or do any additional math practice or problems outside of school, whereas she is very motivated to read for pleasure. She is excited to go to Mathnasium, and thrives on the attention and encouragement the teachers give her to such an extent that she can't wait to get to her next "Mastery Check". I know I could save myself some money and by my own math workbooks or make up my own worksheets on number sense, data management, money, etc. - but I could never reproduce the environment that the Mathnasium staff provide. My daughter has fun with them and she enjoys hearing the staff say "Can I show you another way of doing that problem?" I think that's worth the price tag. You helped my son, who hated math, really enjoy it - through breaking down the concepts. This helped him understand it better and feel more confident. Our daughter Ellie loves Mathnasium. The teachers are patient, thoughtful and helpful. We've seen an improvement in her confidence and grades since she commenced the program. The tutors at the Beaches location have all been very supportive of helping Christian go through the curriculum for Advanced Functions and Calculus this summer in preparation for grade 11. I had actually referred a friend’s son, Holm, who was also at the Beaches location this summer. My daughters experience at Mathnasium was excellent. Staff and very patient and make math fun for the kids to learn. Nadia Pheakos My son loves Mathnasium! He likes the learning concept and the way they teach to make it easier to do math in a way that it's fun. He has an amazing learning experience! And of course Excellent teachers, friendly very knowledgeable and helpful! Especially he likes Marc and Homayras. Keep up the great work! Definitely recommend this place! My son loves going and never wants to leave once he is there. Great program to enhance his math skills. My son needs lots of practice to master math concepts, and Mathnasium teachers have the patience and the training to help. They also really made my son feel welcome and that this was a good place to be after school. We will be back in the fall, I hope. The staff at Mathnasium are fantastic. They demystify math and make it a cool subject to learn. Staff are great and they relate easily to the the students. We have watched our 9 year old son excel tremendously after starting at Mathnasium. The environment, instructors and materials have been very helpful in advancing my son's math skills. we have noticed a huge difference at school as well! My children went from failing marks and low confidence to 80’s and above in just a few sessions. Now they believe they can do anything. Thanks so much! All instructors have been great, especially Mark. They make it fun for the kids. My daughter loves coming to Mathnasuim. The teachers are great! She especially adores Marc and Jordan. They keep it fun and exciting. I would highly recommend this place to my friends. My daughter went from hating math to teaching the subject to her little sister. They saved us! I no longer argue with my daughter over math homework and that is priceless. Bailey is doing very well. It is a system that works for her. Thank you. Mathnasium has truly transformed my daughter. She went from struggling with math to consistently getting >90%....AND she enjoys going! She's confident and proud. You've given her a gift that impacts her life. It's a result of two things: (a) Mathnasium's approach of building math skills (vs. merely helping with homework), and (b) your incredible tutors. My son started at Mathnasium a couple months ago after he suffered an injury and fell behind. Not only did they help him get caught up and raise his grade, but they made it all a lot less stressful. The tutors are great and he really enjoys the atmosphere, which is great because it was a struggle getting him to engage with a private tutor. This is the one of the greatest decision I made for my daughter. They helped her improve a lot and built confidence in solving math problems. Our son actually really enjoys going to Mathnasium. It is not a battle to get him out the door. It is a very encouraging environment that works with a reward system, as long as he completes his work. We find his confidence has improved, he says he likes math now and he openly shares what he has learned. Ben feels welcome at Mathnasium, and actually enjoys his time there. He has been practising and practising, and slowly mastering new skills. I would never have had the patience or the insight to be nearly as effective with him, so I'm very grateful to Mark, Jordan and the whole team in the Beaches. Great teachers and fun environment for learning. Your staff are wonderful! They are fun and are able to engage my boys on a personal level. My kids consider them to be friends. Scheduling is easy and flexible; my kids love going. Great people. My kids love coming here! I love the place. My daughter really loves it. My only issue with the place is the toxi parfum smell. It is very strong and it so healthy but aside from it I will recommend it to my friends. The staff take the time to get to know the kids, how they learn best, and are great about giving feedback along the way. It's a friendly place and I'm glad it's in the neighbourhood. I really appreciate the one-on-one teaching and how the teacher's engage with my son. It's not all about math. The instructors make it fun. The thing that makes Mathnasium for is how awesome the teachers are. They are not only enthusiastic about math, they are cool dudes. They share interests with my kids and can chat with them about it too. It makes it seem less like tutoring and more like hanging out...with learning math. It's awesome. The enthusiasm of the teachers at Mathnasium in the Beaches is infectious. It's so much fun seeing our girls' faces light up when they get dropped off and their pride when they update us on how much they have accomplished during their session. Thank you! We have seen an improved outlook toward math in our daughter..we want to keep it up! Clark is gaining in confidence with relation to math and that is all I have wanted. Surprisingly, his work ethic overall has improved even with home chores. I did not see that coming! Amazing team of instructors and excellent methodology. Chantel's math skills and confidence have greatly improved with Mathnasium. Our Son has been struggling with math for his entire school career. Now in grade 10 it has become more important than ever for his future success. One on one tutors were intimidating and did not address the root of the problem - he didn't like it! Mathnasium has been the solution we have been looking for. They created an environment that made learning enjoyable. He has been consistently grasping his basic skills and moving them forward into more advanced applications. Best of all, he enjoys it and happily attends his sessions. I would highly recommend the program to any parent looking to help their child find their inner mathematician! What I like most is that you instill a sense of mental math, and comfort with numbers. The school simply don't do that anymore. You're helping my daughter immensely. The staff at Mathnasium were very helpful and so great with my girls. Staff are kind, patient and engaging - my son is enjoying his sessions. Haven't seen a report card since he started his sessions but fully expect to see positive math skills feedback. I notice a real difference with Finn... he is enjoying math now and his confidence has increased. For the last few months Noah has way more confidence. Since bringing our daughter to Mathnasium her marks have significantly improved,she feels more confident about tackling her math assignments and is actually starting to enjoy it. They constantly assess your child's needs to ensure they build an appropriate program. Also, the Beach team is terrific. The instructors were engaging and knowledgeable. My two teenage sons did not complain about going which speaks volumes about the program! 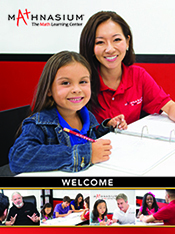 I recommend Mathnasium for your child's math tutoring needs. My daughter (6th grade) was in Mathnasium last year and it really helped her comprehension, her grades, her understanding of how to manage her time and tackle homework. She ended up going from hating math and barely passing to doing very well and in fact, all of her grades went up which I credit to Mathnasium. The best thing was that she went from feeling dumb and dreading tests to being confident, raising her hand in math class and nailing it! My son started high school this year and really started floundering in math - a subject he had always done well in - in the winter. We talked about it and I put him in Mathnasium in April and while I haven't seen a grade difference yet (it took a few months with my daughter as well) I know it will make a difference when he takes his finals. He likes going and feels it they are explaining things he wasn't understanding and now he "gets" it or they are working on units that are still coming up which means he is comprehending it quickly in class. I only wish I had put him in the program in January or February. I have a very active and sporty son who absolutely LOVES mathnasium. He does not go because he is struggling in school, rather because he has a blast with self learning and with the young teachers. It has given him increased confidence in math at school and assists him in slowing down and being more thoughtful in his learning. This peaceful and supportive learning environment is a great balance to the sports arena and makes him a more well rounded little 8 year old! Finn loves going to Mathnasium! He always leaves excited and we have noticed his confidence has been boosted in a very short time. My son was struggling in math and needed immediate help mid-semester. I got him into two sessions a week and it helped him to have the confidence and understanding he needed to do well in his final exam. Thank you! He loves it and we see great proficiency results Thanks! I believe the classes have really helped my daughter. She is more confident and loving math. My son has gone to many places for tutoring and this is the first time he hasn't complained. the location is very close to our house, which is great and the atmosphere is relaxed. It is a wonderful, calm environment for my son to learn math. A focused work area is helping with math learning, as well as kind and caring educators. I appreciate the fact that my boys are challenged when they work at Mathnasium. It is not easy to sell two high school young men on tutoring but both of my boys actually enjoy the experience. They don't complain on the days they attend which speaks volumes! Very warm and friendly environment. My daughter was given lots of positive encouragement. Wendy was extremely helpful and accommodating while the instructors were all very helpful and took the time to explain to me, what the girls were working on. LIly and Elle both really enjoyed their experience at Mathnasium! My kids have fun when they are in session and they are making noticeable improvement within their studies at school.